Hey guys. I hope it's okay to post this here. I tried contacting some of your admins/mods, but never heard back, so I assume they're busy. If I've posted this in the wrong place or anything, please let me know. I’m very excited to invite your community to participate in Season 6 of the Werewolf/Mafia Championship. The Mafia Championship is an annual forum-based tournament series that pits representatives from various online Mafia (aka Werewolf) communities against one another as they compete to determine the Internet’s greatest forum Mafia player. Each participating community democratically elects one person to represent them and be their “Champion”. The tournament first started back in 2013. Since then, 270+ different communities and 50+ different nationalities have been represented. 1. DO YOU ACCEPT THE INVITATION? If your community wishes to participate, please confirm your participation to Thingyman as soon as you can to ensure yourselves a spot. Currently, the plan is to accommodate 187 communities this season (last season featured 170 communities), and if interest is high enough we will expand even further to 204. If your community agrees to participate, the deadline for selecting your representative is April 26, but the sooner the better. Your representative should be prepared for having to read upwards of 600 posts per 24 hours during the early stages of the game. Additionally, there’s a requirement that each player must make at least 10 posts per Game Day. Only active players should apply/participate. I repeat: Your chosen player needs to be able to promise a good amount of activity on a daily basis. 187 communities will participate, each sending one representative. 11 Qualifying Games will be played, consisting of 17 players each. I.e. every representative plays in one Qualifying Game. The players themselves vote post-game to determine who is deserving of advancement. 1st place will advance directly to the Finale Game (i.e. 11 of the 17 finalists are found this way), while the 2nd place finishers will advance directly to one of the two Wildcard Games. WILDCARDS: A Jury consisting of finalists from Season 5 will discuss and vote to determine 23 players in total deserving of a second chance. They will play in 2 Wildcard Games along with the aforementioned 2nd place finishers that advanced directly to these games. From each game, three players will advance to the Finale Game based on a post-game player vote, just like in the qualifying phase. THE FINALE: The Finale Game is played. Once it has completed, the players vote to determine who shall receive the title of Season 6 Champion and a winner’s certificate signed by Dmitry Davidoff, the creator of mafia. The setup is called Mad17 and features 17 players. 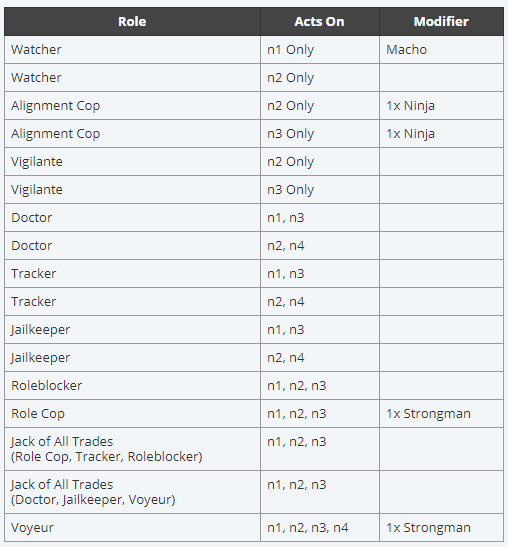 Each of the following 17 roles will be assigned at random to one player in the game without regard for the player's alignment. Each role is restricted to using its action only on the nights listed on the chart. - Role reveals at death are alignment only. You will not learn a player's exact role when they die. - Majority is not in effect. - Votes are automatically locked in at LYLO. - Mafia factional kills are assigned. They can be tracked, watched, or roleblocked. - Mafia share a factional Night Kill, which is a single standard shot for their faction. - Mafia members may perform the faction kill in addition to their regular action at the same time. - Mafia may communicate at any time. - Tied votes will result in a player being lynched at random from among the tied players. - Each individual player may make a maximum of 200 posts per day phase (this restriction is lifted 2 hours before day end). - The game will have a host to oversee everything and make sure everyone’s following the code of conduct, but otherwise the game is completely automated (automatic votecounts, thread locks and reveals roles automatically, the bot receives and processes actions, etc.). There will be 11 Qualifying Games, and your representative plays in just one of these. They will have start dates during the months of April, May and June. So in other words, as long as your representative can play sometime during that period, they should be good and I’ll make sure they get scheduled into a game that suits their schedule well. I.e. if your rep is busy until June, that isn’t a problem. If you want to get in contact with me ASAP, you can find me on (Thingyman#6075). Fair warning, we're terrible at Werewolf. The requirements are too numerous and strict. I would so do this. I love werewolf. Sadly I dont think my school schedule will permit it at that time. Theres no such thing as summer break for us. This tournament is mostly all about having fun, making friends and creating bonds between communities. There have been communities participating that had only played a couple of games. Fair enough. I wouldn't say there are MANY requirements, however. There's really only one: You need to make a minimum of 10 posts per game day. And then of course you need to follow the rules, but those shouldn't be too different from what you're used to. If you are interested, you can basically pick any start date between April 29 and June 17. So as long as you can play for about 2 weeks anywhere during that time frame, you should be good. I'm the best at werewolf. But i've given up that life. Orange claimed to be our best, but I've never seen him play Werewolf. So I couldn't say that's an incorrect statement. I've heard he use to host a lot, but not play. Bender is better known for hosting though. Faithy or Beex has played it more than anyone else on AL. Couldn't say for sure which has played it more often. It sounds interesting, but I don't have the time to meet the strenuous requirements. I play werewolf to have fun. I don't have the time to read a bunch of posts a day and write a bunch as well. If I didn't work, I could do it. Work is obviously more important than a game is. So I'll stick with spending my time working instead of playing the werewolf game. I'm probably a contender when I play to be one of the good players of the game. Though, I'd never claim I'm the best. I've looked at all kinds of ways to play the werewolf games too though. So that helps. Most of the time when posts are required it means you need to write a justification for your votes or your actions. So, stating I'm just going with the flow, doesn't work. It's for more serious werewolf game players. Further, we prefer werewolf over mafia. While they are similar, Werewolf is the game we play, not Mafia. We also like the roles to be simplex and not to complex. We've tried some complex roles, but while we like are werewolves games it's more of a leisure game for us to enjoy. Of course, that's how I see it.